CAMPAIGN CATCH-UP: Another day, another photo-call. Politics, 2012 style, demands that election candidates are high-profile and seen in as many favourable situations as possible. So it is that Steve Reed, the Labour candidate for Croydon North, seems to have posed for more photographers’ pictures in the past week than Croydon’s most famous magazine model, Kate Moss. 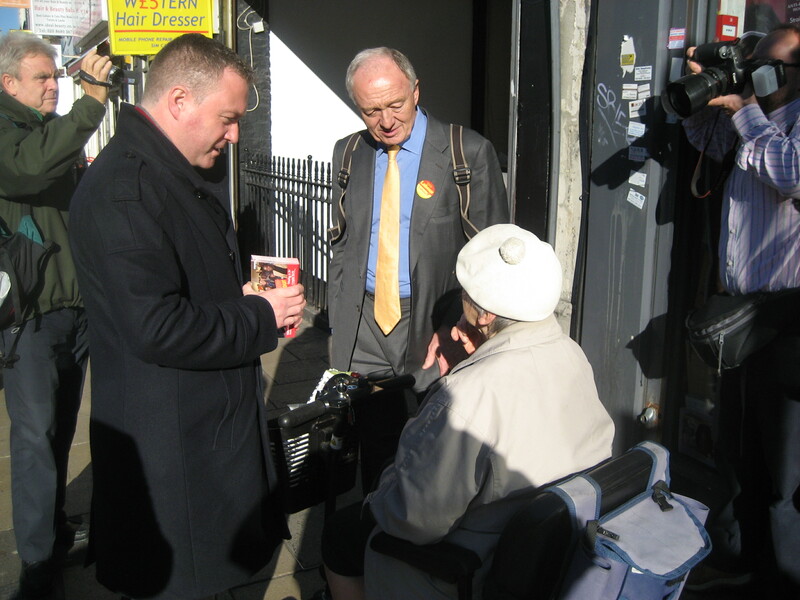 Yesterday, it was out on the stump on London Road with Ken Livingstone in a very public demonstration of party unity. 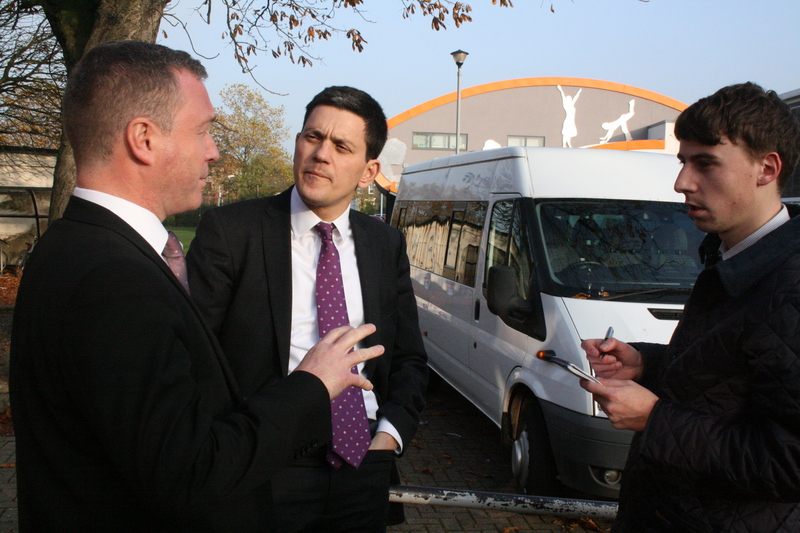 Today, Reed’s duet was with David Miliband – two very much off the same song sheet as far as their party policies is concerned – all neatly done at the world-famous BRIT School. You half expected a chorus of Fame!, though that might have drawn unwanted attention to the former foreign secretary, who has had an almost subterranean public profile since his defeat in the party leadership election to his brother. Tactfully, no one suggested that they sing We Are Family. 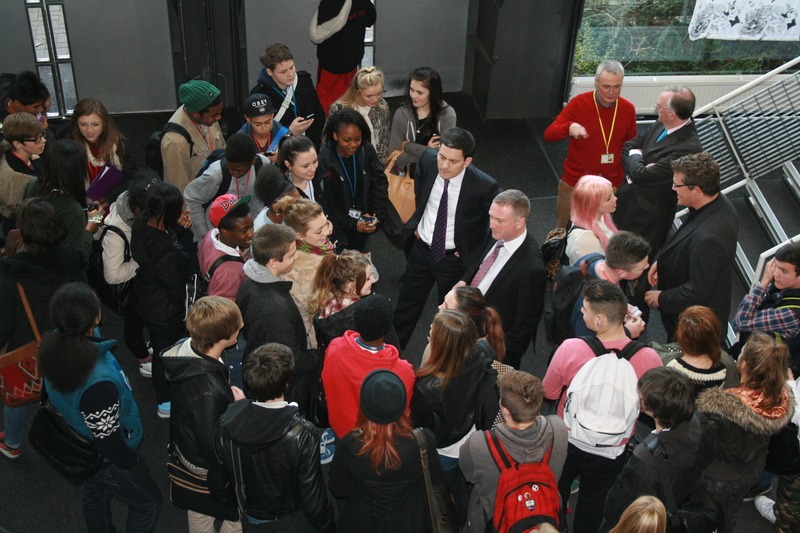 Miliband and Reed’s very presence at the BRIT represented something of a turnaround in Labour’s attitude to the school. Their party had opposed its establishment in 1991. Times change. “Labour moved away 20 years ago from a suspicion of working on securing excellence in schools with outside private sector partners,” was Miliband’s on-message, third-way message. That is very much the outlook which Reed shares, and Miliband was full of praise for the candidate. “He’s thoughtful, insightful, brave and a leader. He’s the kind of person we need in parliament to help deliver more for less. “He’s an innovator. I was impressed today by what he was telling me and the sheer scale of regeneration proposed,” Miliband said of Reed’s plans for more jobs in Croydon North. There was, perhaps, less of a meeting of minds on Wednesday with Livingstone, who had, after all, once been the employer of one of Reed’s opponents in the by-election, Lee Jasper, the candidate of what will be described on the ballot papers as “Respect (George Galloway)”. Livingstone spent an hour going up and down the road where much of the worst damage was done in the 2011 riots. And he was always ready to slow right down for the needs of the photographers, too. Only six months after his last election campaign, Livingstone clearly enjoyed being back talking to voters who very much warmed to him. It was also only 15 months since Livingstone had toured the same road, stony-faced, the day after the 8/8 riots. Reed and Livingstone heard repeatedly from shopkeepers that Riot Act compensation money due from Boris Johnson’s City Hall had not arrived or that bold promises from Prime Minister David Cameron had come to nought, as regularly reported by Inside Croydon for its loyal reader. Folo Sotubo, the pharmacist at A-Z Pharmacy, took the complaints further as Reed and Livingstone made the time to hear his concerns in detail. “People have been making promises about regeneration here for 13 years, but nothing happens,” Sotubo said, ominously. Livingstone pointed to the East London line connection at West Croydon as a worthy investment that he had put together as London Mayor. The regenerative opportunities of the new public transport links appear to have been overlooked by the local council, which has used Boris’s riots fund in the town centre and on pedestrian crossings near the Town Hall. The Conservatives still promise that £7 million will come to West Croydon, later. 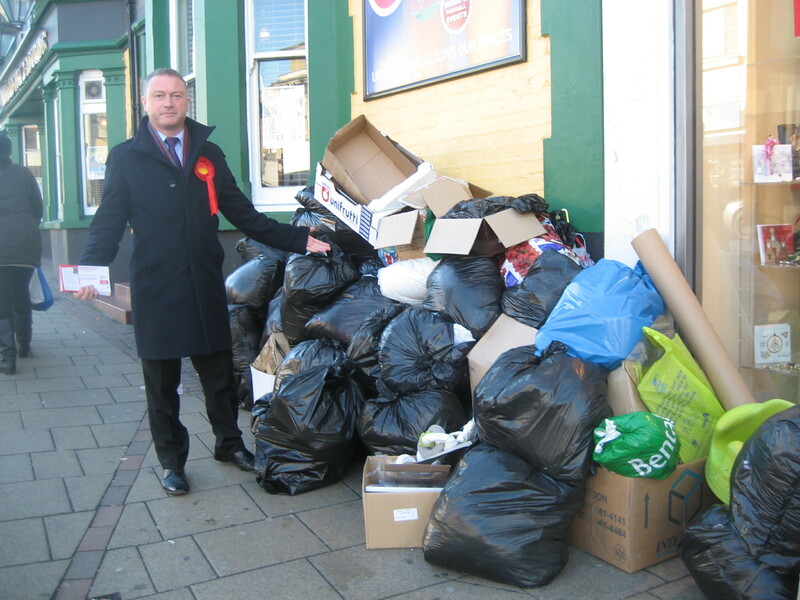 Reed never ceases to express his amazement at how shabby Croydon looks, with its many piles of uncollected litter and rubbish. That he is able to boast how much worse Croydon now is in comparison to Lambeth, where he has been council leader for six years, underlines how much the fortunes of the two boroughs have flipped. Croydon people used to make fun of Lambeth council’s performance. After the Reed campaign had moved on, at less than 100mph, Jasper was out on London Road himself, trying to get some posters up. Now that really was slow going. This entry was posted in 2012 by-election, Boris Johnson, Croydon North, Ken Livingstone, Lee Jasper, Mayor of London, Steve Reed MP and tagged Croydon, Croydon North, David Miliband, Ken Livingstone, Labour, Lee Jasper, London, Steve Reed MP. Bookmark the permalink.